If you were to buy a GTX 970 for $330 and run it for a year it would cost you another $220 in electricity ($0.14 per kWh) but you could sell it after a year for ~70% of the original value ($230) so you’d end up paying $320 for 20.5 Mh/s for a year instead of $871. And of course you could mine something else or sell it in case Eth suddenly goes to PoS. With margins like that they don’t even have to buy any hardware and mine, just buy Eth and send it to you and still take a huge profit. @admin where is there prove of mining? This will end just like Cointellect or Bitcoin cloud service. I know you are not promoting it but maybe you need to just ignore a ponzi or add a big waring at bottom and top, a lot of people will lose Bitcoins again. 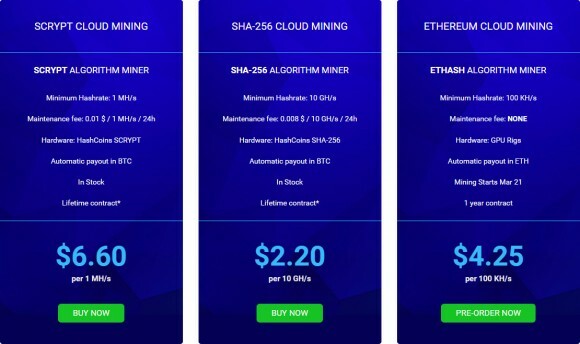 Yeah definitely wouldn’t like to invest in cloud mining, seeing a lot fo them has been HYIPs. Mining is a bit risky in that regard, but Ethereum still is quite nice.